ParentEntityType is code of entity from which you want see activities of child entities. ChildEntityName is scheme name of child entity. Lookup is the relational field between parent and child entities. This plugin work for History too. I am trying to implement this solution in CRM 2011. I have registered plugin on RetrieveMultiple message on activitypointer, Plugin triggering only when i am viewing activities from Activities link on Home page. 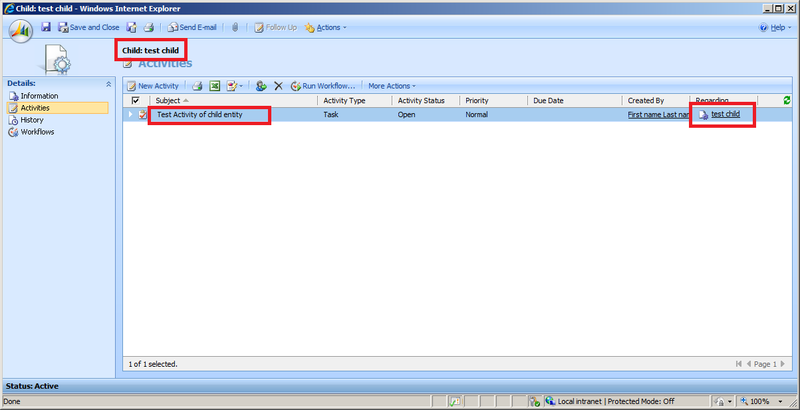 when i am checking activities on Account entity its not firing the debugger to check. Any help from you.. RetrieveMultiple will trigger from any entity right while viewing activities. Thanks for your response.. The solution which you have provided is an unsupported one. Is there any supported solution to implement activities Roll-up functionality for custom entities? BTW,I am using CRM 2011 online version, we can't perform unsupported customization's on it..
Any thoughts on CRM Online? also we have multiple child entities. Workaround provided in article works with webcontext that is unavailable in SandBox plugins. So I believe it could be complicated to do that. Possible workaround is development of custom webresource using html+js or SilverLight. Great plugin and works nicely with CRM 2011! Great work !! – I have modified and developed your plugin for CRM 2011. I have a question about the prefiltering view in the account entity. The new_activity lookup Activity Data is now only shown in the Related View and not in the linked associated view. It is possible to show the activity in the linked associated view and not in the Related View. RetrieveByParty (only Activitities which are directly linked (related) to the account. 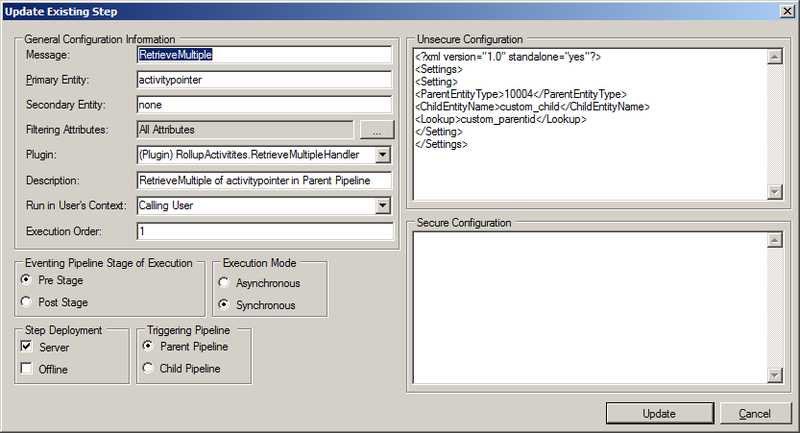 With the modified Plugin the activities of my custom child entity with own activities are only shon in the RetrieveByParty view. I have seen that you posted are unsupported SQL Statement for enabling SDK Message Rollup. Is this perhaps a possible way to show the activitities of the custom entity in the RollupRelatedByParty View? Do you have some experiences with this "dirty" change?